I made a small panel cooker using cardboard with back panel size 15in x 12 in and side panels of the same size. I realized while using this cooker at Palo Alto, (30 deg N) a lot of radiation was reflected back to the sky. I tried using a small top panel --again about 12inx12in with aluminum foil--to cover the top. Since I intend using the cooker in early mornings and late afternoons at this latitude, I made the top panel a sloping one ---like a sloping roof,by making cuts at the side panels to fix this top one. The performance improved significantly--the cooking time was reduced by 30% compared to the cooker without the top panel. I tried cooking potatoes--the usual vegetable I use for trial measurements which took about an hour on 30th Jan 2011. With this modification, this panel cooker appears almost like a Telkes solar oven tilted vertically or any solar oven sans the glass chamber for the pot. I used a blackened cooking pot ,set on a black can to raise the level for maximum capture of the radiation. I hope that this modification of panel cooker would be adopted by cooker designers for panel cookers at higher latitudes. Thank you very much for this excellent and helpful information. This is an issue that is quite common with a variety of solar cookers; lost energy due to bouncing and out-reflecting rays, and especially so with many panel style solar cookers. 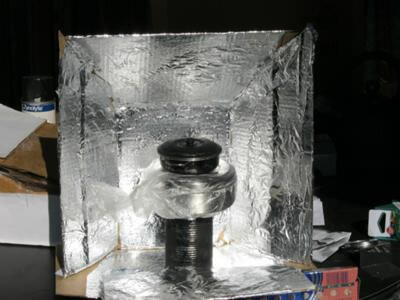 I am sure many people will find your information very helpful in their own solar cooking efforts. Thank you for including a photo of your cooker as well. Very Interesting. So the dark can heats the air inside of it which rises and heats the bottom of the pot? This heats the bottom of the pot better since cooler air is shielded by the can. I think I will try this. I like your idea of raising the pot. Thank you for sharing. Thanks for your comments. The can is open at the top so that hot air reaches the bottom of cooking pot.My aim was to keep the cooking pot near the center of the panel. I have tried simple trivet to keep the pot raised from the bottom and also a plastic ring with three pillars so that light is reflected on the bottom of the pot. It is always better to heat the bottom of the pot so that cooking takes place faster. Generally in panel cookers , the lid of pot gets heated up fast and it can lose the heat also by heating the surrounding air. This reduces the efficiency. Nice creative adjustment to increase solar energy on the top side. When I first noticed the can that the pot is sitting on, and how wide it is, I wondered if it would keep the bottom of the pot from warming since it is shielding the suns rays all across the bottom of the pot. Then I realized the can is painted black. So, I assume it is heating up. I can not see if the top of the can is open. Does the heat pass through from the black can to the pot's bottom? Or would this arrangement work better if light could pass through the item used to support the pot? Just wondered if you had tried other arrangements and what the results were.